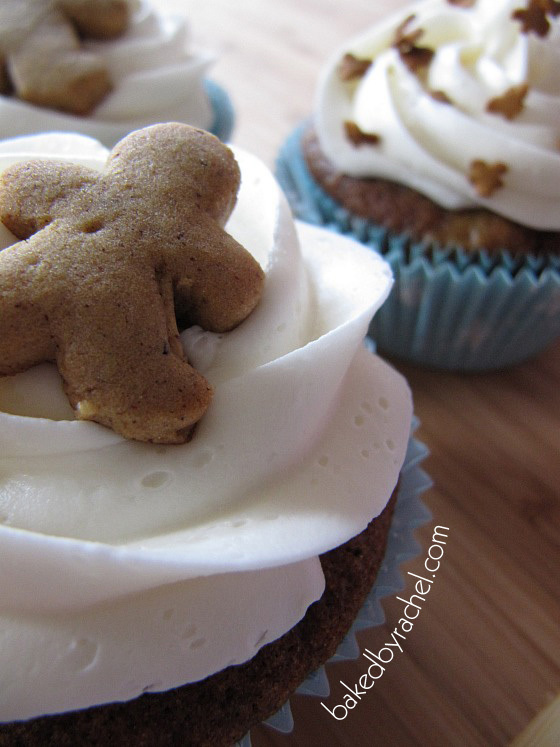 Moist and flavorful gingerbread cupcakes, topped off with homemade miniature gingerbread cookies. Can you believe that Christmas is only 5 weeks away?! Insane right? I know that we still need to get through Thanksgiving and believe me … I’m not trying to rush it by because Thanksgiving is great in it’s own ways BUT we’ve got to start thinking about all of the delicious items that can be made for the Christmas season. I have plenty of goodies in mind to share so be sure to check back often, or better yet… why not subscribe to my feed so you’re guaranteed not to miss anything. A note for previous subscribers: we recently switched feed services so if you have had issues with receiving updates lately, please check your feed info and redo if needed to continue receiving updates. For starters I wanted to try gingerbread cupcakes. Searching around, the few recipes I did come across didn’t seem super special so I opted to stick with the recipe I used for the pumpkin gingerbread trifle. The gingerbread was super soft, moist and absolutely tasty. And because it raised well it seemed like a good option for cupcakes too. Beyond the cupcake, I had planned to do frosting from scratch but in the end I was scary low on butter so I stuck to Duncan Hines white frosting. In a fix, say when you’re out of ingredients, you absolutely cannot beat the handiness of jar frosting. It’s ready to be used without any effort on your part. I don’t always use jar frosting but I do like to have some on hand, just in case or when I want that special taste… because yes, premade frostings do taste different than what you would make at home. For a playful finish, I made gingerbread cookies – really small gingerbread men. I made two sizes, both of which are smaller than a house key – to give you a bit of perspective. 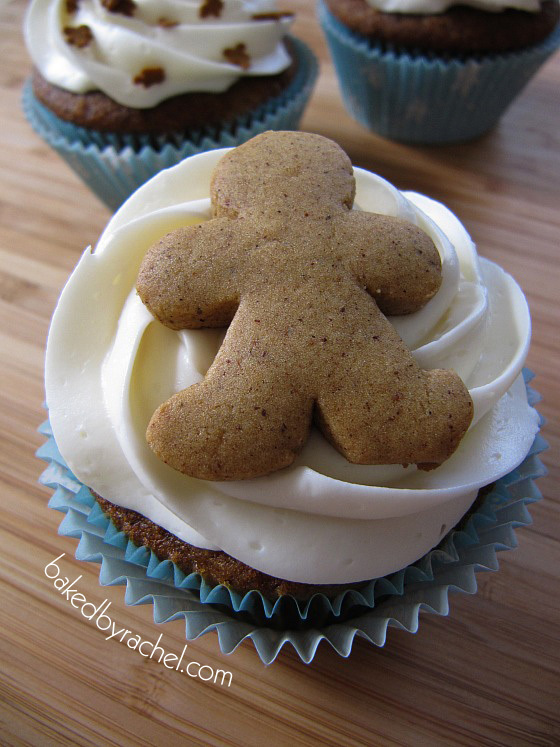 If I had been to the grocery store prior to making these cupcakes I might have seen the cute package of mini cookie cutters which so annoyingly includes a gingerbread man. It’d have saved me a lot of time considering I cut mine out by hand, carefully tracing around tiny paper cutouts with a sharp knife. Hey… I wanted cute cupcakes so it was my own fault but I don’t see making dozens of those anytime soon. Too small but definitely cute as a topping! If you’d like to recreate these cupcakes, I’d highly recommend picking up some mini cookie cutters. You’ll be thankful I didn’t tell you to cut them all out by hand. I also decorated some of the cupcakes with gingerbread men sprinkles which can easily be found at any craft store this time of year. Preheat oven to 325 degrees and prepare a cupcake pan with liners. In a medium bowl, cream butter and sugar together. Add flour, water and molasses. Mix well, always scraping your bowl as needed and prior to any new addition. Add egg, baking soda and spices. Mix until just combined. Divide batter equally among cupcake liners using a large cookie scoop. They're very handy so if you don't have one, get one or put it on your Christmas list. Something like that is a perfect stocking stuffer for someone who loves to bake! One scoop should fill each cup roughly 3/4 full. Do not fill more than that. 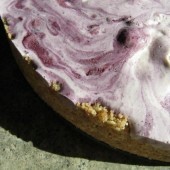 Bake in a 325 degree oven for 18-20 minutes or until a toothpick (or cake tester... another neat stocking stuffer!) inserted comes out clean or with just a few crumbs clinging on. Mini cupcakes should be done around the 12 minute mark. Decorate with your favorite homemade or jar frosting and top with additional accents if desired. Oh my gosh–adorable! Such a bummer you didn’t find the cookie cutter first, but your hand cut one look great! These are so cute! 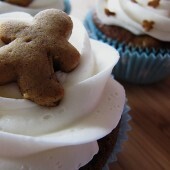 I love the gingerbread men topping. I want to make these for Christmas! Adorable! Love the little gingerbread guy on top! These look SOOOOO cute!!!!! You really are a great cucpake decorator! These look so fantastic! I just baked up a double batch (I added ginger and vanilla to the mix) and they smell scrumptious! So glad you found me! :) I hope you like them as much as we did. 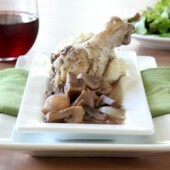 These are so adorable… and the recipe sounds amazing!! 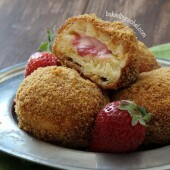 These look great, I’m going to make them tonight with a cinnamon cream cheese frosting! Were they really done that quickly at 325? I’m used to baking cupcakes at 350 for around the same number of minutes. Yes they really were! :) My favorite traditional cupcake recipe calls for baking at 350 and only 15 minutes so every recipe does vary a bit as do individual ovens. Start testing at 18 minutes for a toothpick to come out clean or with a few clinging crumbs. Good luck and let me know how yours turn out! I’m going to post them on my blog tomorrow and I’ll be sure to link back to you. Thanks for the recipe! Fantastic! Glad they turned out. Can’t wait to see yours. Can someone help me. My cupcakes are always hard and crunchy on the top. I can’t be sure what the issue is but can certainly make some suggestions for you to look into. Make sure your oven rack is in the middle position, too high or too low could result in uneven baking or browning. Your oven temp could also be off. If you don’t have an oven thermometer I’d recommend picking one up and pop it in there next time you turn the oven on. Check to make sure the thermometer and the temperature you set the oven to are the same. If they do not match, adjust your oven temperature as needed. If all else fails, maybe reducing your bake time would help a bit. Try checking earlier to see if a toothpick comes out clean. If it does, they’re done. Good luck!